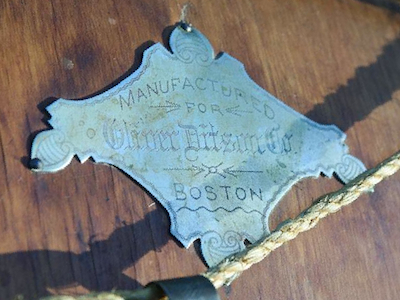 The ties between Boston's Oliver Ditson Company and Chicago's Lyon & Healy are evident in the similarities between the two firms' products. It is no mystery as to why, since in 1864 it was Oliver Ditson & Co. who provided the capital to help establish P. J. Healy and George W. Lyon in Chicago. The companies obviously maintained some form of business relationship for many decades to come and the instrument featured here is just another example of that arrangement. From Elise Abrams Antiques in Great Barrington, Massachusetts comes an enormous rope tension bass drum dating from circa 1890 which bears a label telling us that it manufactured by Lyon & Healy for Ditson. 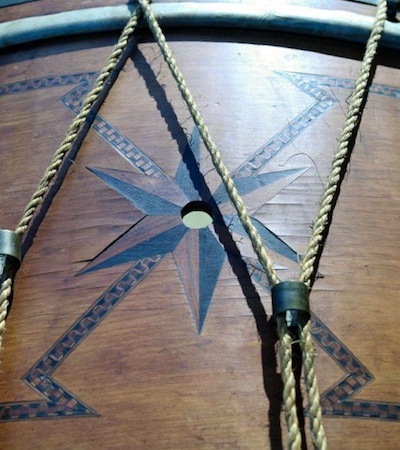 The geometrically patterned wooden marquetry adorning the shell is a common feature on Lyon & Healy's "Monarch" drums around the end of the 19th century. 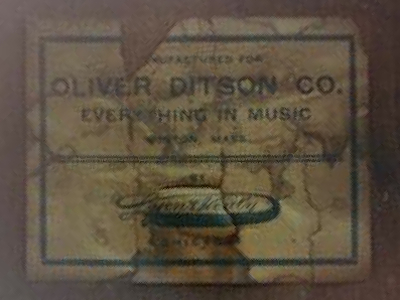 The hand engraved silver plaques, or oversized 'badges', are beautifully engraved with wording stating, again, that this instrument was manufactured for Oliver Ditson, not by Ditson. But the most striking thing about this bass drum is its sheer size. The reported diameter is a whopping 40 inches! Instruments of this size were not frequently produced for a number of reasons. For one, shells this large were difficult to build and drumheads of the necessary size were challenging to locate. Also, transporting such a behemoth would have presented logistical problems for most drummers. And given the amount of sound that a 40 inch bass drum could generate, an instrument of this scale would have been best suited for performance applications involving a very large group of musicians such as a full concert band or symphony orchestra. 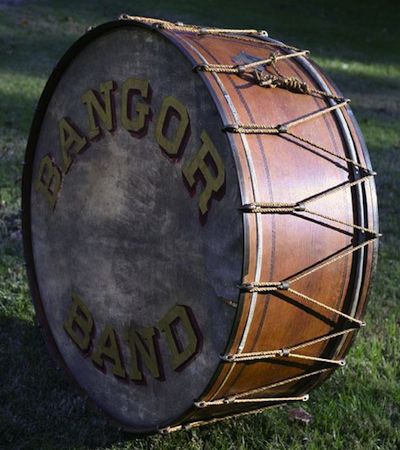 From the lettering on the drumhead, it appears that this instrument hasn't traveled far from its home in Bangor, Maine where it belonged to the Bangor Band. 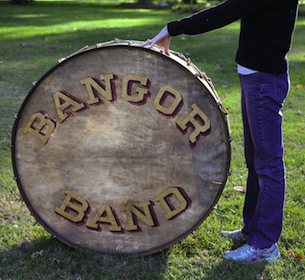 Amazingly, after more than 100 years, the Bangor Band still exists. 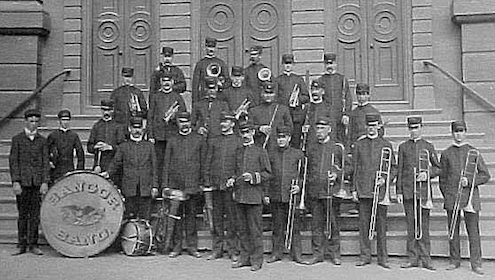 And even more incredibly, a historical photo on the band's website taken on Memorial Day in 1898 shows a group of musicians posed for a picture with their instruments including what may be this very drum! The wording on the head is a very close match to the one still mounted on the drum minus the logo in the center. And if nothing else, the size of the drum looks to be quite large, the height reaching higher than the waist of anyone who stands next to it.